THEY are considered one of the world’s most elegant Royal couples. 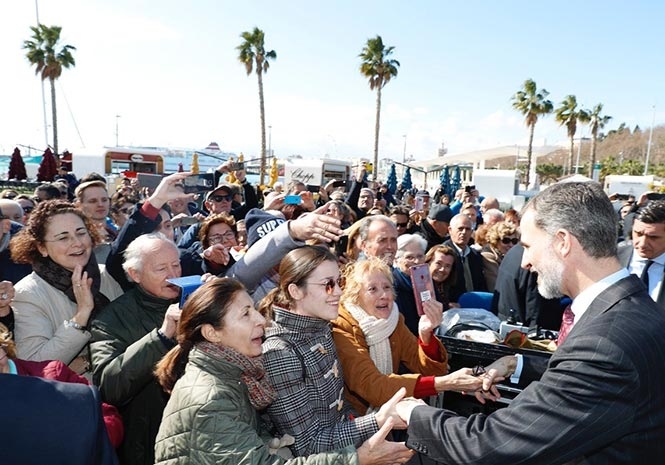 And King Felipe and Queen Letizia of Spain did not disappoint as they headed to the Costa del Sol for a state engagement. Impeccably dressed as ever, the regal pair visited the Pompidou Centre modern art gallery in Malaga City to present this year’s Gold Medals of Merit in the Fine Arts. While Felipe, 50, chose a dark suit with red patterned tie for the occasion, 45-year-old Letizia wowed in a two-piece Hugo Boss navy suit with matching polka dot silk blouse. She completed the functional but stylish look with a pair of navy blue ‘animal print’ heels by Spanish luxury designer Magrit, one of the monarch’s favourite brands made in Elda, Alicante. Her accessories included a bicolor blue and red leather clutch by Caroline Herrera plus a pair of Tous earrings decorated with sapphires, pearls and white gold. The awards, which honoured individuals and institutions excelling in the arts and cultures fields during 2016, were presented in front of around 300 guests, with the Royal duo accompanied by Spanish Education Minister Iñigo Mendez de Vigo, Andalucian president Susana Diaz, Mayor of Malaga Francisco de la Torre and provincial leader Elias Bendodo. And while the majority of those handed the accolade were Spanish, foreign recipients included French museum director Philippe de Montebello, 81, and Cuban-American singer Gloria Estefan, 60.